The town acquired the suffix Regis (meaning "of the king") in the 13th century, when Edward I used the harbour as a base for his campaign against the French. In the late 18th century Lyme Regis became a fashionable seaside resort. A favourite with the novelist lane Austen (1775 to 1817) who had a cottage overlooking the seafront. 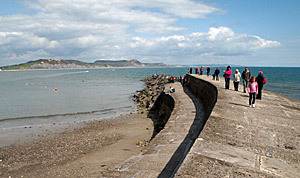 Lyme Regis has five small beaches, plus a 14th-century breakwater called The Cobb, which has been featured in several films, including a famous scene from 'The French Lieutenant's Woman'. The coastal view includes the Golden Cap, at 617 ft (188 m) high, which is the highest cliff on the south coast. Lyme Regis and its crumbling cliffs are renowned for their abundance of fossils. The first recorded finding was in 1811, when Mary Anning, just 12 years old, found a fossilized Ichthvosaurus in the rocks, a 30 ft long aquatic reptile which lived 140 million years ago. The remains of which are displayed in the Philpot Museum. St Michael's Church, built around 1500, contains a stained glass window dedicated to her memory. Fossil hunting on the beach - the best time for which is early spring. If you are unable to find any fossils then you will find a generous display in the Town Museum on Bridge Street. Charmouth, 2 miles east of Lyme Regis, is a quaint little holiday resort with Regency houses, that's well worth visiting. Charmouth beach (shown below) is also very good for fossil hunting.